Meteorites are meteors which have impacted with the Earth's surface. 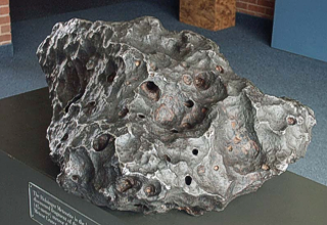 Meteorites produce circular craters, the diameter and depth of which are dependent upon the size, composition and speed of the meteor and the geology of the impact site. Larger meteorites can produce craters like the Barringer Meteorite Crater near Winslow Arizona USA which is about 155 meters ( 508 feet ) deep and 1300 meters ( 4265 feet ) wide. The meteor pictured here is one of the many Diablo Canyon meteorites assiciated with the Barringer meteorite crater. Meteoric impact is the most popular theory for the extinction of the dinosaurs.